It states that every object will continue in its state of rest or uniform motion in a straight line unless a resultant force acts on it. Inertia of an object is the reluctance of the object to change its state of rest or motion. Inertia of an object depends on its mass. The greater the mass, the greater the inertia. This means it is harder to start moving, stop, slow down, speed up or change direction. Note that a force is required to overcome the inertia. Also, if forces acting on the object are balanced, the resultant force is 0 N. This means the object is in a state of equilibrium. It states that when a resultant force acts on an object of a constant mass, the object will accelerate in the direction of the resultant force. The product of the mass and the acceleration of the object gives the resultant force. (1) When acceleration is 0, it does not mean there is no force acting on the object. It only means net force is 0 N. e.g weighting scale measures a force (our weight) acting on us. (2) Zero acceleration implies the object is in a state of equilibrium (at rest or at constant speed / velocity). It states that for every action, there is an equal and opposite reaction, and they act on mutually opposite bodies. e.g If body A exerts a force FAB on body B, then body B will exert an equal but opposite force FBA on body A. To help you understand Newton's Laws better, you can play with the applet below. After opening the applet, choose acceleration section. (1) When no force is applied to the box, it remains at rest. (2) Select all the boxes on the top right corner to see the values when you play the applet. 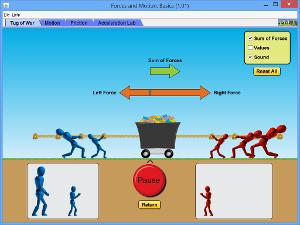 (3) Move the slider on Friction to extreme left to have 0 frictional force. (4) Move the slider on Applied Force to either right or left (direction does not matter here) and hold it for a while. Once the box starts to move, release your finger from mouse so that no force is applied to the box. You will see the box continues to move in the same direction with same speed. (1) Refresh the page by clicking the refresh button located below the Friction slider. (2) Again, select all the boxes on the top right corner to see the values. (3) Click the right arrowhead to increase the value of Applied Force acting on the box. You will see that when the applied force is equal to the friction, the box will not move. It only starts to move when the applied force is greater than the friction, which means the resultant force (sum of forces in the applet) is not zero. Therefore, the box moves with constant acceleration (observed from acceleration bar) and speed increases at constant rate. (4) Refresh the page by clicking the refresh button located below the Friction slider again. (5) Move another box to the top of original box and repeat step 2 and 3. You will see that you need greater applied force to move the boxes with greater mass now!